The basics of radars is that a beam of energy, called radio waves, is emitted from an antenna. As they strike objects in the atmosphere, the energy is scattered in all directions with some of the energy reflected directly back to the radar. The larger the object, the greater the amount of energy that is returned to the radar. That provides us with the ability to "see" rain drops in the atmosphere. In addition, the time it takes for the beam of energy to be transmitted and returned to the radar also provides is with the distance to that object. By their design, Doppler radar systems can provide information regarding the movement of targets as well as their position. When the WSR-88D transmits pulses of radio waves, the system keeps track of the phase (shape, position, and form) of those pulses. By measuring the shift (or change) in phase between a transmitted pulse and a received echo, the target's movement directly toward or away from the radar is calculated. This then provides a velocity along the direction the radar is pointing, called radial velocity. A positive phase shift implies motion toward the radar and a negative shift indicates motion away from the radar. Doppler radar sends the energy in pules and listens for any returned signal. The phase shift effect is similar to the "Doppler shift" observed with sound waves. With the "Doppler shift", the sound pitch of an object moving toward your location is higher due to compression (a change in the phase) of sound waves. As an object moves away from your location, sound waves are stretched resulting in a lower frequency. You have probably heard this effect from an emergency vehicle or train. As the vehicle or train passes your location, the siren or whistle's pitch lowers as the object passes by. Doppler radar pulses have an average transmitted power of about 450,000 watts. By comparison, a typical home microwave oven will generate about 1,000 watts of energy. Yet, each pulse only lasts about 0.00000157 seconds (1.57x10-6), with a 0.00099843-second (998.43x10-6) "listening period" in between. Therefore, the total time the radar is actually transmitting (when the duration of transmission of all pulses each hour are added together), the radar is "on" for a little over 7 seconds each hour. The remaining 59 minutes and 53 seconds are spent listening for any returned signals. The NWS Doppler radar employs scanning strategies in which the antenna automatically raises to higher and higher preset angles, called elevation slices, as it rotates. These elevation slices comprise a volume coverage pattern (VCP). Once the radar sweeps through all elevation slices a volume scan is complete. In precipitation mode, the radar completes a volume scan every 4-6 minutes depending upon which volume coverage pattern (VCP) is in operation, providing a 3-dimensional look at the atmosphere around the radar site. Take it to the MAX! Volume Coverage Patterns: Turn it up! Take it to the MAX! Beam me up! An addition to the NWS Doppler radar has been of dual-polarization of the radar pulse. The "dual-pol" upgrade included new software and a hardware attachment to the radar dish that provides a much more informative two-dimensional picture. Dual-pol radar helps NWS forecasters clearly identify rain, hail, snow, the rain/snow line, and ice pellets improving forecasts for all types of weather. Another important benefit is dual-pol more clearly detects airborne tornado debris (the debris ball) - allowing forecasters to confirm a tornado is on the ground and causing damage so they can more confidently warn communities in its path. This is especially helpful at night when ground spotters are unable to see the tornado. These two images show how dual-polarization helps the NWS forecaster detect a tornado producing damage. 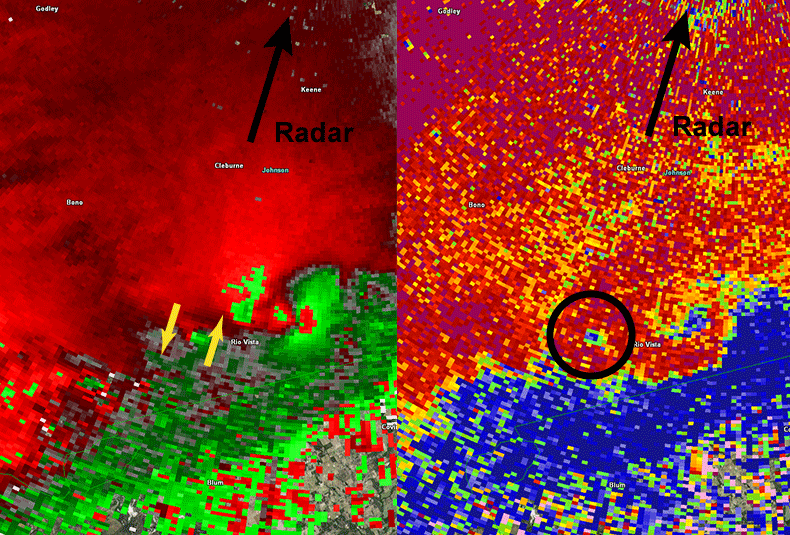 The left image shows how the Doppler radar can detect rotation. Between the two yellow arrows, the red color indicates outbound wind while the green colors indicated inbound wind relative to the location of the radar. Prior to dual-polarization, this is all we knew that there is a rotation near the earth's surface. Unless there were storm spotters visibly watching the storm we would not know for certain that a tornado was present. The right image shows how dual-polarization information helps detect debris picked up by the tornado so we have confidence of a tornado as these two areas coincide. All modern radars are Doppler radars. Therefore the old-time radar sweeping line is no longer applicable. Some local television stations continue to show a sweeping radar on their broadcast however. The sweeping arm is fake. The radar image itself may be valid but the sweeping arm is added by the computer. Even if it appears an image updates once the line passes any particular storm, that sweeping line is computer generated and not real.